Kris Boyd’s brace, along with an opener from the returning Andrius Velicka in his first start since August, gave Walter Smith’s men a deserved victory. Now they’re back in control of their own destiny in the title race and taking three points without nine first-team squad members will have given them a massive lift. Despite the makeshift look of the home side, this was their third win in six days and it has been one of the better weeks in recent times for the club. Given they hadn’t won three league games in a row since September before this fixture, Gers will take confidence from the fact they’re building a winning run again. Back when they had a quadruple of consecutive successes seven months ago, a triumph over Well was included in the collection. A day to remember at Hibernian’s Easter Road was also there as they won 3-0 in Edinburgh and Smith will now look ahead to his team’s next trip there in eight days time. The team news for Gers fans before this game was hugely dramatic, with Velicka’s recall eclipsed by the unexpected return of Steven Smith in Sasa Papac’s absence. Between the Lithuanian and his near-forgotten team-mate, the pair had waited 20 months for a start and it was Smith’s first top-team outing of any sort for 51 weeks. With Celtic only drawing at Hearts in the lunchtime kick-off, it was up to the Light Blues to make the most of their opportunity to make up ground. And for the third game in succession – after good starts at Falkirk and St Mirren – they came roaring out of the traps to take an early lead. Within two minutes, manager Smith’s decision to draft Velicka in from the cold paid off handsomely as he put the hosts in front. 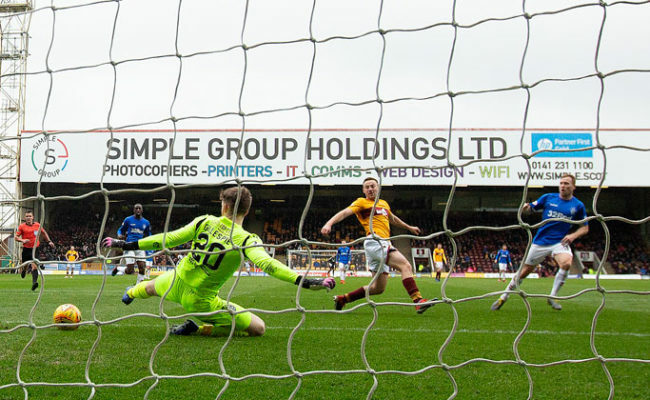 Motherwell could only clear as far as defender Smith on the left and Boyd’s intelligent glancing header from his cross caused all sorts of problems for the Steelmen’s defence. With a stack of bodies going for the loose ball, Velicka got to it first and scrambled in from close range when he latched on to Maros Klimpl’s backpass. The visitors just couldn’t find their rhythm in the opening exchanges and Steven Whittaker twice found space on the left before failing to find his man. Where he couldn’t make his chances count, Boyd certainly could with a magnificent second goal less than 10 minutes in. Whittaker’s long, clearing header played the hitman through and his bad first touch actually helped him as he then fired into Graeme Smith’s far corner from 25 yards. 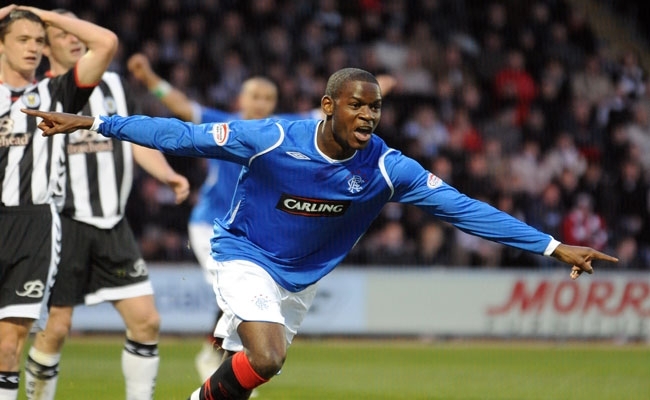 Ibrox rose as one to acclaim the strike – Boyd’s 27th of the season – and at that point Rangers were in total command. The onus was on Mark McGhee’s Well outfit to come back at the home team, especially as they were in need of points to aid their bid to break into the top six of the SPL. But the closest they came to pulling one back initially was when Jim O’Brien crossed to John Sutton. Even then, he volleyed well over the upright. 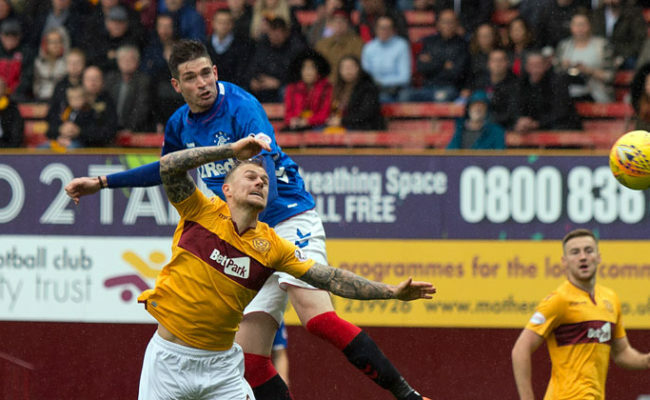 With half-time approaching, we nearly saw a repeat of Boyd’s superb goal against Partick in September. As was the case back then, Steven Davis picked him out on the left of the penalty box with a pinpoint cross-field pass. But this time, with Boyd further out and having less of an angle to contend with, he sent the ball flying high and wide of the target on the volley. With little else to talk about, Motherwell then made a game of it again when they cut Rangers’ lead in half eight minutes before the break. Sutton was the scorer, connecting far better with the ball and sending a stinging half-volley into the top corner of the net on turn from 25 yards with Alexander helpless. The Light Blues set about trying to restore their cushion and Boyd warmed Smith’s hands with a rasping shot but couldn’t net and it was 2-1 at the break. 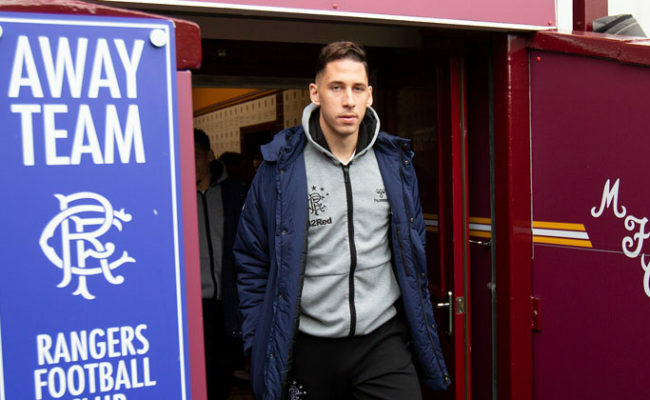 Conscious of what happened last month against Hearts – when Gers lost a two-goal lead and drew – it’s safe to say some stern words were said in the home dressing room. Whatever was discussed had minimal impact at the restart as the hosts continued to probe without creating much. Boyd forced a good save from away goalie Smith but David Clarkson might then have levelled had his shot not deflected off Sutton and away from the target. Rangers introduced Nacho Novo for Velicka in an effort to turn the tide and Boyd soon had a chance to make it 3-1 when Davis slid him in but he shot across goal and wide. Soon after, Davis forced a corner and when that was scrambled clear, the ball back in won the Light Blues a contentious penalty. Mendes was probably fouled when he went down in the box under Brian McLean’s challenge but there didn’t appear to be much contact as the midfielder fell. Regardless, Referee David Somers pointed to the spot straight away and Boyd made no mistake from 12 yards. Novo gave chase to Davis’ pass as he tried to grab a fourth but he was foiled and Whittaker hit the bar after a good passing move between him, Boyd and Mendes. 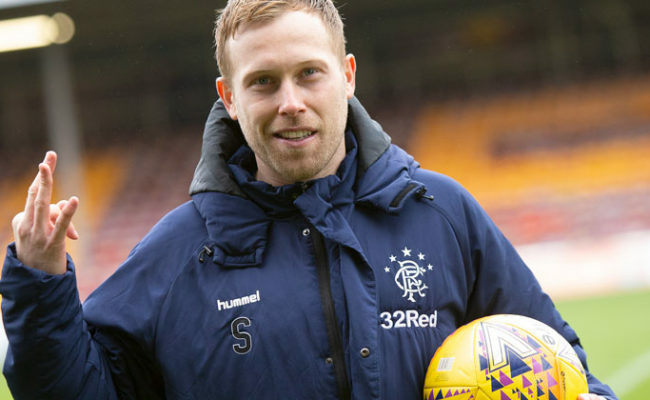 It was clear that netting again had lifted some of the pressure on Rangers and they began to look more relaxed when they were in possession. Although they couldn’t add to their tally, they were worthy of the lead they’d work hard for but looked like they might not hang on to for a spell. Now attentions turn to the capital and with morale rising and more than a week to prepare, the outlook is improving.